1. Drop the folders into your Strike Fighters folder. If asked to overwrite, click yes. Big Thanks to Dels and all people involved in creating this fine plane. Also to ace888 for the great templates! If I missed someone, please contact me and I change that ASAP! 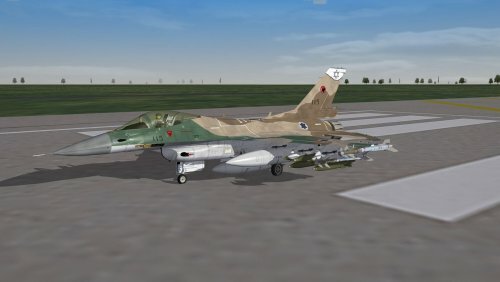 Fictional skin for Viper Teams' F-16C Block 30/32 to make it look like a fictional fighter plane for the croatian air force. 2. Drop the skin folder into the desired aircrafts' folder. Drop the Decals folder into the Objects folder. If asked to overwrite, click yes. And also big thanks to Dave for providing the templates! 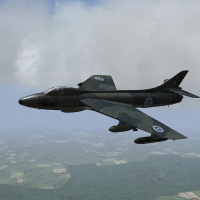 Fictional mod of the stock Hunter FGA.9 to make it look like a fictional fighter plane for the finnish air force. And also big thanks to Sundowner for the outstanding templates! 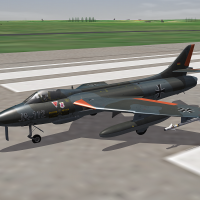 Fictional mod of Foxmonters Super Etendard to make it look like a fictional attacker for the west german navy. It shall depict a bird that could have entered service in the german air forces if the military had not had the "double-engine doctrine" caused by the high losses inflicted by the Starfighter (or "Widowmaker"; nickname from the german pilots). See included readmes for further notes and original credits. Foxmonter and all other involved people for the aircraft itself. Ravenclaw_007 for the german pilot included here. Wrench for the combo pak from which I've taken the model from. Flogger23 for the great template. This is only a skin, not a full mod, for the F/A-18 A/B/C/D Hornet. This skin represents what a Hornet might have looked like in argentine navy service. All credit belongs to ALL the people involved in the creation of the Hornets. Special credit goes to Oliver Anguille for his effort and hard work. May he rest in peace. Thanks to Jarink for the templates. Finally thanks to Spinners for squadron badges used in this mod. 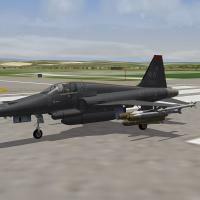 This is a mod of Mirage Factorys F-5E Tiger II to make it look like a fictional plane for the US air force. The need for a fast, agile and versatile attack plane led to the construction of this plane. The R&D department of Northrop Grumman went a more unorthodox way: They took the F-5E Tiger II contruction plans and started modyfing some of the parts and remodeling the fuselage, wings and interior fuselage ompartments. The improvements were astonishing, even for the engineers from Northrop Grumman. The entire hull is composed of a titanium alloy coating a skeleton of carbon fibre and a steel/titanium alloy, making possible a high loadout both under the wings and fuselage. General Electric improved the former engines of this plane replacing the injection system, using less parts and reducing the weight of the engines by using different materials. This improvements lets the engine develop more than 30% dry and wet thrust than before. Also the avionics and the radar got modified enabling the use of the most air-air and air-ground-weapons. The radar used is the AN/APG-70V1. This made necessary the removal of the left gun leaving the muzzle there for cooling purpose of the new and advanced electronic equipment. The right gun was replaced with a 20mm M61A1-Gatling Gun. The "TacTiger" made its maiden flight on the 18th of October of 2011 and entered service in 2012. Thanks to all the people of the Mirage Factory for this plane and to Macelena for adapting it to SF2 Standards. This is a combined mod produced by two people, so the special thanks goes also to Teras for his help! You'll need SF2 Israel Expansion Pack 1 for the proper decal use. 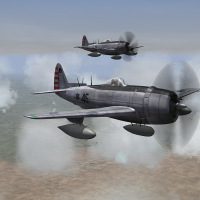 Simply drop into your P-47N-15 Thunderbolt aircraft folder. Big thanks to RussoUK for this great plane and to Wrench for bringing it to SF2 standard. 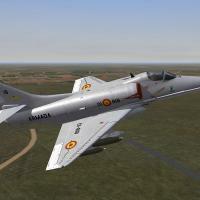 Fictional mod of the stock MiG-21MF to make it look like a fictional fighter plane for the spanish air force. YOU WILL NEED BOTH SF2:E AND SF2:I AT LEAST TO GET THIS PLANE RUNNING! In the end of the 1960s, the HA.210 Hidalgo got outdated due to the appearance of new fighters and weapons. The new Semi-Active Homing-Technology made the Hidalgo a easy target for medium and long-range attacks. A new fighter, able of carrying the allied equivalent, tha AIM-7 Sparrow, was needed. Hispano-Suiza and CASA competed in the production of this new plane. Hispano-Suiza won the competition with the fighter called "Trueno". The design was sleak but robust. The maiden-flight of the plane was on the 21st of January of 1971 and the 111th and 113th squadron were supplied with this plane in December of the same year. This is a mod of the Super Hornet F from EricJ to make it look like fighterplane from the japanese air self defense force. In 2011, the actual minister of defense, Toshimi Kitazawa, wanted the air force to be more powerful and well equipped than they are now. Even the F-2 and the F-15J and DJ seemed not to be modern enough. Kitazawa was of the opinion, with the rising of China and the becoming dangerous of northern Korea, the air force as main line of defense had to grow in strength. During that same year, Japan and the US signed a contract over more than 120 planes, primarily F-Type, of the Super Hornet. Being modified by Mitsubishi Heavy Industries for being capable of using the modern japanese missiles. Being odd at first sight, the new aggressor camo of the first squadron to receive the plane reflects the mood of its pilots, showing the enemy that there will be no retreat..just like Samurai. The unperfect camo concerning some stains along the colour borders are wanted and shall recall the japanese calligraphy. The first planes will enter service in 2012 in the 8th, 302nd, 303rd and 305th Hikotai. 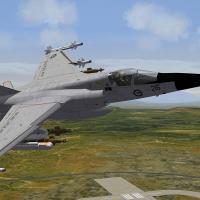 EricJ – Purchased Model of F/A-18F from http://www.mesh-factory.com, Main texture artist, ini editing. FastCargo – 3D model work for all versions. Used some of his images for reference. JAT81500 – FM, ini adjustments, decals. Dave – Decals and always a swell guy. Also did the Hangar and Loading Screens. Reference photos. Also for modifying some weapons for SF2, and for adjusting his afterburner texture from the Eagle Superpak. 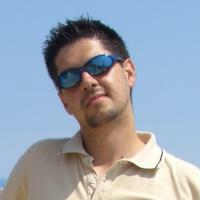 Vampyre – Technical Reference and consultant who works with the aircraft on a daily basis. Column5 – Use of the Mirage Factory F/A-18A Textures, and FM data adapted from the MF F/A-18A. 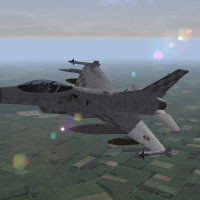 AmokFloo – Initial optimization of the F/A-18F model. Bpao – F/A-18A pit used with permission. 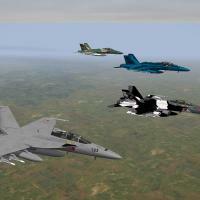 STORM – F/A-18E Loading Screen Image, taken from his special vantage point. 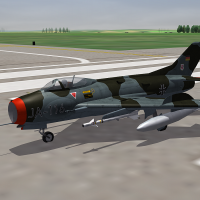 starfighter2 – Newer RWR texture. 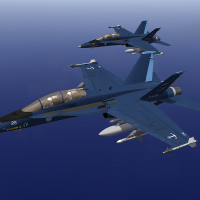 Serverandenforcer – F/A-18F FM tweaking. Silverbolt – Extracting the textures for the cockpit for SF2. 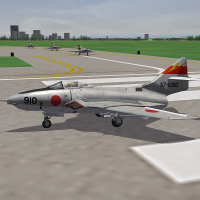 MigBuster – Tutorials in the Knowledge Base for adapting the aircraft to SF2. SidDogg – Assistance with getting the VFA-102 CAG bird tanks right. Spillone104/Spectre8750 – Custom sound, Spillone104 for initial, and Spectre8750 for tweaking. ArturR: For his use of his avionics mod. FastCargo mentioned it and after checking it out was impressed… Thanks! Special thanks go again to EricJ for giving me his template for the VMFAT-Skin. Otherwise the skinning of the aggressor skin would have taken a long time. Thanks again. Fictional mod of the stock F-14A_77 to make it look like a fictional fighter plane for the japanese military aviation branches. YOU WILL NEED SF2NA AT LEAST TO GET THIS PLANE RUNNING! The folder "Alternative Skinfile" contains the nose skinfile for the 8th Hikotai skin without anti-glare panel. Thanks to pappychksix for his awesome Tomcat templates. Mod of the superb Mirage F-1CG from the Mirage F-1 Team to make it look like fictional fighter planes for the royal australian air force. 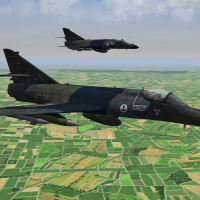 YOU WILL NEED THE MIRAGE IIIO DLC FOR THE DECALS OF THE F-1CO! CO+ includes upgraded parts like radar, engine and integrated ECM from the Mirage 2000. For the weapons you'll need to have one version of the F-1 already installed. The Weapons were created by the Mirage Factory and therefore not covered by the permission. 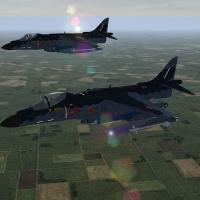 Big Thanks to the Mirage F-1 team for the creation of this superb mod. Also thanks to Ludo for allowing me to release it. - Skins : Ace888 and Ludo.m54. Fictional mod of the MiG-29C and MiG-29K by Russouk2004, derived from The Mirage Factory MiG-29A, to make them look like fighter plane for both the brazilian air force and Navy. 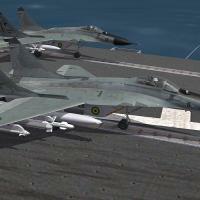 First of all, thanks to TMF for the creation of the MiG-29C; a great model produced there! Furthermore big thanks to Russouk2004 for the creation of the naval Fulcrum. Really great work on this aircraft. Original readmes from Russos MiG-29C and K are also included. Credits to MF factory etc...as seen below,in original Readme. Hope you enjoy this a\c as much as I do. Any problems,report to CA as I regularly look in. FastCargo for the loadouts and help with the folding wing issues I had.and testing. Fubar is doing an FM...and testing. thnx to others for advice and references. Hope this mod will do until we get new models. Thnx for downloading and enjoy. For any further questions don't hesitate to contact me. Same goes if I forgot something or somebody. In that case I'll change that ASAP. Fictional mod of the stock Hunter FGA.9 to make it look like a fictional fighter plane for the german Luftwaffe. Big thanks to Sundowner for the outstanding templates! 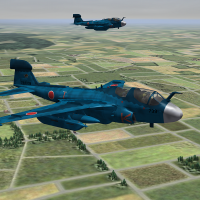 Fictional mod of the stock A-6A Intruder and EA-6J Prowler to make them look like fictional attacker planes for the japanese air self defense force. These planes use an aliased A-7E-Cockpit. YOU WILL NEED SF2:V AND SF2:NA AT LEAST TO GET THESE PLANES RUNNING! Also big thanks to Wrench for the great templates used! Fictional mod the stock A-4E_65 Seahawk from SFP:V to make it look like a fictional attacker plane for the spanish navy. 1. Drop the Folders into your Strike Fighters Mod Folder. Also thanks to Spinners from whom I borrowed some of the decals. This is a mod of Bobrocks Av-8B+ to make it look like a plane from the japanese air self defense force. A skin for the 8th Hikotai is included sporting the two-tone blue scheme. for some of the loadouts. To enable the plane to take off vertically, you have to adjust the thrust of the four engines by changing the SLThrustDry value from 25000 to at least 33000. But then, the plane will be able to fly more than Mach 1. Many thanks to bobrock and all the others involved in this great model! Also special thanks to Brain32 for adapting it to SF2-Standards. It represents a "what-could-have-been-if" airplane for the JASDF in the 6th FBS, 5th Wing, stationed at Matsushima AFB in the late 1950s. Big thanks to Pasko and the others involved in the creation of this nice little bird. Also special thanks to NeverEnough for adapting it to SF2-Standards. Fictional mod of the MiG-29C; converted to MiG29K by Russouk2004; from The Mirage Factory to make it look like a fictional fighter plane for the Argentine Navy. Also thanks to him for allowing me to upload this mod. To Spinners for some of the decals I used. Original readme from Russos MiG-29K is also included. 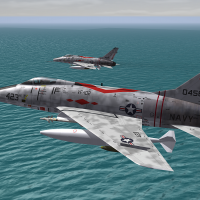 Fictional mod of the stock F-100D_68 to make it look like a fighter plane for the US Navy. YOU WILL NEED AT LEAST SF2:V OR SF2:E TO GET THIS PLANE RUNNING! 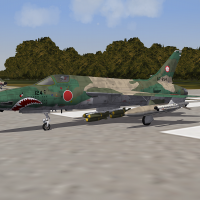 Skin depicted is the VF-102 "Diamondbacks"
And also to hgbn for his outstanding templates for the Hun D.
Fictional mod of the stock F-105D_66 to make it look like a fighter plane for the japanese air self defense force. And also to Sundowner for his outstanding templates for the Chief. 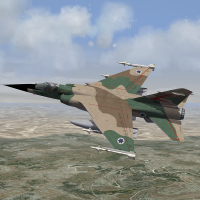 This is only a skin, not a full mod, for the Mirage 2000C-S1 of TMFs Mirage 2000 pack. This skin represents what a finnish Mirage 2000 might have look like in finnish service. All credit belongs to ALL the members of The Mirage Factory for their fantastic work they did with this model. 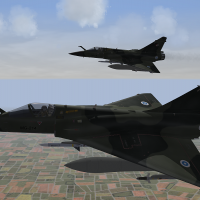 Also thanks to slick cowboy for sharing the template for the Mirage 2000. 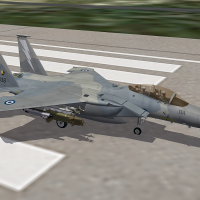 Fictional skin for FastCargos F-15 Eagle pack to make it look like a fictional fighter plane for the greek hellenic air force. 2. Drop the folder "330" into the corresponding F-15 Eagle folder, you want to use this skin with. 3. Drop the folder "Decals" into your Objects folder. If asked to overwrite, click yes. 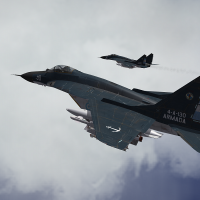 Big Thanks to FastCargo and all the other people involved in the creation of the F-15 pack! Big thanks also to EricJ whose templates I used! Fictional skin for Russo's MiG-29C mod to make it look like a fictional fighter plane for the finnish air force. 1. Drop the folder "Ilmavoimat" into your MiG-29C aircraft folder. 2. Drop the folder "Decals" into your Objects folder. If asked to overwrite, click yes. 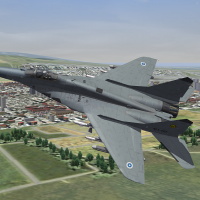 Big Thanks to Russouk2004 for the modification of TMFs MiG-29A to create the MiG-29C. Big thanks also to Sundowner whose templates I used! Mod of the superb Mirage F-1CG from the Mirage F-1 Team to make it look like a fictional fighter plane for the israeli air force. The Weapons were created by the Mirage Factory and are therefore not covered by the permission.